We look forward to meeting new and returning campers each year. 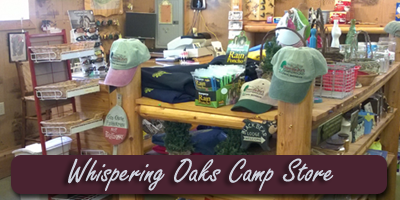 We continue to add camping related items to the Whispering Oaks Camp Store as well as groceries, personal items, t-shirts, sweatshirts, and a nice selection of gift items. There is a game room in the east end of the store. The game room has pin ball, board games, card games, cable TV and much, much more. We have a picnic pavilion and large fire pit in the community area near the bathhouse. The pavilion is available at no charge to our campers and can be reserved for large groups. We continue to upgrade and improve the appearance of the campground. We are planning to renew the cabin's interiors. We are also working on the grounds, adding new gardens and relaxation areas around the campground. We are now offering outside, unsecured storage for RVs. Please call for prices and details. We invite you to make new memories and recount the old in a clean, quiet and friendly stay.